Setembro é o mês do regresso às aulas e, para mim, o regresso às receitas no blogue e ao ginásio. Para uma pessoa que nunca gostou de desporto, o ginásio é um sacrifício mas pelo menos quando estou lá tenho tempo para pensar no que poderá ser a próxima receita. September is the month to go back to school and, for me, the return of the recipes on the blog and the gym. For a person who never liked sports, the gym is a sacrifice but at least when I am there I have time to think about what could be the next recipe. Para o chantilly, ferver as natas com a raspa de lima e folhas de hortelã. Refrigerar por uma noite. Para a massa, bater a farinha com o açucar, sal, fermento, ovo e leite na batedeida com o gancho de amassar. No final, juntar a manteiga amolecida. Logo que a massa estiver lisa, deixar descansar 30 minutos. Colocar a massa em moldes de baba com um saco de pasteleiro. Deixar repousar por mais 30 minutos. Levar a forno pré-aquecido a 180º durante 20 minutos. Para a calda, ferver a água com o açúcar. Retirar do lume e colocar o rum e hortelã. Deixar em infusão 15 minutos. Embeber os babas na calda e colocá-los sobre uma rede. Para o chantilly, retirar as folhas de hortelã das natas e batê-las com o açúcar. Assim que estiverem a ficar firmes adicionar o mascarpone. Colocar o chantilly nos babas com o saco de pasteleiro com uma boquilha canelada. For the whipped cream, boil the cream with the lime zest and mint leaves. Refrigerate for one night. For the pastry, beat in the flour with the sugar, salt, yeast, egg and milk in the electric mixer with the kneading hook. At the end, add the softened butter. As soon as the dough is smooth, let rest 30 minutes. 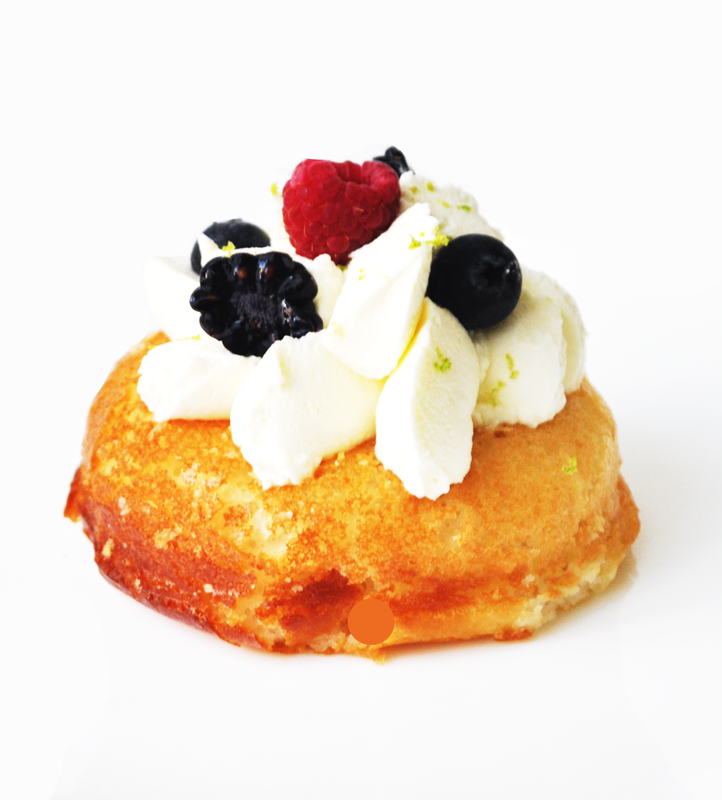 Spread the dough into savarin molds with a pastry bag. Leave to rest for 30 minutes. Lead to preheated oven at 180 degrees for 20 minutes. For the syrup, boil water with sugar. Remove from heat and pour the rum and mint. Let it cool for 15 minutes. Soak the babas into the syrup and place them over a pastry network. For the chantilly, remove the mint leaves from the cream and beat them with sugar. As soon as they're getting firm add the mascarpone. Place the whipped cream in a pastry bag and frost the babas.